Above, we see the preparations for the X-mas feast. This kitchen is at the back of the straw and wood house, and the cooking hearth is a small cement bucket in which they burn wood for fuel. This is on top of a wooden frame filled with hard packed dirt, so that any flying embers don't burn up the house. The young ones are here as well, learning young how to make traditional Akha food. This man, above and below, is making one of the most interesting foods I have ever eaten. He is mincing pig organs (liver and heart, I think) with a cleaver, for several long minutes chopping and mixing. 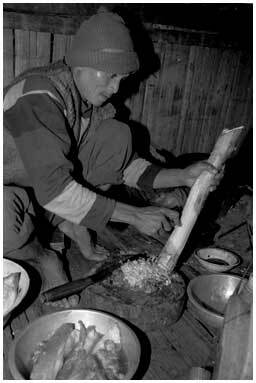 As he chops, he adds pig blood and fat, some spices and herbs, and finally, as you see below, some wood from this branch. 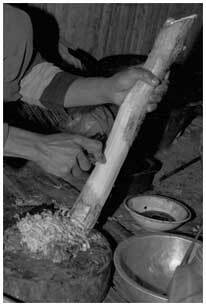 He has scraped the bark off with a spoon, and then scrapes off the meat of the tree into the mixture. After everything is mixed and chopped, half of the mixture will be cooked, the other served raw. All is ready, and we sit down for our special meal. 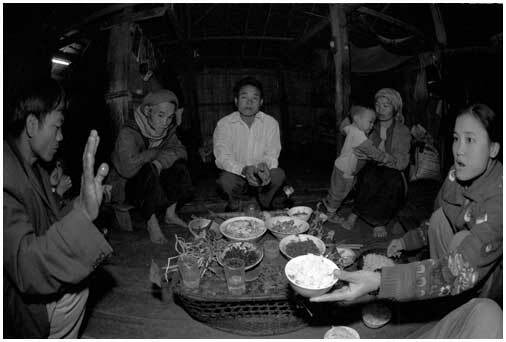 You can see the old man who had been invited over, and the man at left is also a special guest--he has somewhat of a big man in the village, and has been making the rounds, though he is not eating much at this table. The older, more senior people of the house are served first, and as they get their fill and retire to another corner of the house, others will move in to take their places. On the table is noodle soup, smoked pig fat, and plenty of herbs and vegetables. We eat using chopsticks for most of the items, and a spoon for the soup. 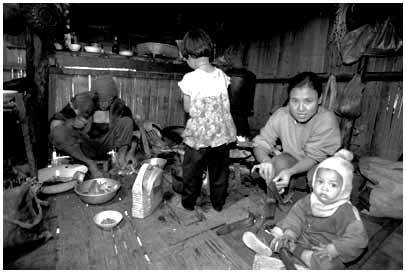 Everyone receives a bowl of rice, upon which they place the other food items--just reach out with your chopsticks to take what you like, a very communal style of eating. And how was the food? Maybe it is something about farm fresh ingredients, but this was one of the most memorable meals I've ever had--including the pig liver and tree wood concoction, which was incredible!